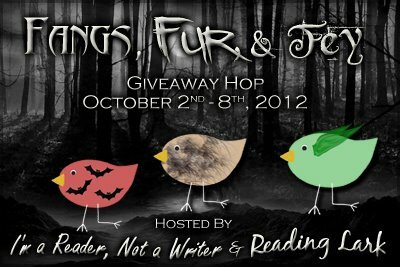 Welcome to my stop on the Fangs, Fur, & Fey Giveaway Hop hosted by two fantastic blogs, I Am A Reader, Not A Writer and Reading Lark! I wasn't going to participate in this hop because I've been so incredibly busy lately (hence the lack of posts) and only posting giveaways, but I LOVE books with any sort of fantasy or paranormal aspect. I couldn't resist! I am out of town as this is going up, so I'm going to leave the prize picking up to you. You can choose any book with either fur, fangs, or fey in it, granted that it is Less Than $10US. Sounds good, right? Live somewhere that can get shipments from Amazon, Fishpond, or the Book Depository for free. Be Awesome (and fill out the Rafflecopter). Following is NOT required, but it is always appreciated. Your options are on my sidebar, but I will tell you that I am yet to figure out Linky. You can help me spread the word, but it isn't required either. You're also welcome to enter my OTHER GIVEAWAYS while you're here. Thanks for stopping by and happy hopping! That was quick and easy. :) Thank you very much for this opportunity! Thanks for the giveaway. I'm a new follower from the hop. The quote on your Rafflecopter is a great, thought-provoking choice for this giveaway. =) Thank you! Cool quote. I always say, I am not into the horror genre, if I want to be scared or feel sick I will just watch the news. Great quote! Thanks so much for the chance to win! Thanks for doing this giveaway (and the super easy entry)! Wow... Only one entry... Thank you for this!!! And, cute quote!! !